Giving back to our community is an essential part of our studio philosophy! Our students know the importance of helping those less fortunate as well as supporting events that bring our community together! Our dancers and gymnasts make SSD&G proud when they use their talents to benefit our community. We provide these opportunities for students and staff to contribute to, participate in, and learn more about our local community. We are always looking for new ways to encourage our students to become active community members! Indiana’s annual “It’s A Wonderful Life” parade is one of our favorite community events! 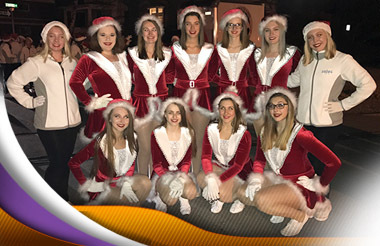 Each year our students have the opportunity to sign up to participate in a parade routine that we perform down Philadelphia Street to kick off the holiday season! We also have a holiday float for our younger dancers and gym students to be part of the parade! 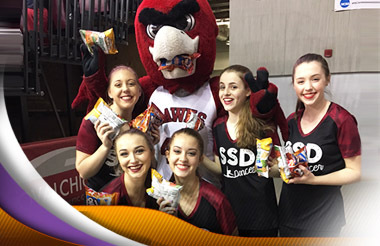 A few years ago we had the opportunity to have some of our dancers perform a routine at the IUP Men’s and Women’s basketball games at halftime! We’ve been fortunate to form a relationship with the organization. We’ve appreciated the opportunity to continue to perform at a few games each year, during the school's winter break! Our dancers work hard to prepare and look forward to each performance! Go Hawks! We take advantage of any opportunity for our students and organization to give back to our community. Students volunteer to ring bells for the Salvation Army’s Red Kettle Campaign every holiday season! 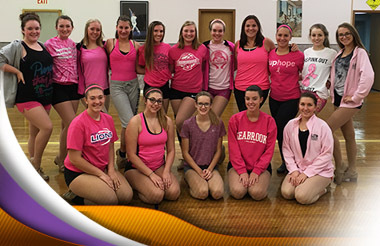 Over the past few years, our SSD&G Pink Out has become a tradition. During the month of October we encourage students to wear pink in support of Breast Cancer research/awareness month and in support of all types of cancer fighters and survivors! The proceeds from selling bottled water at the studio are donated annually. In the past, we’ve donated to the American Cancer Society and Birdie's Closet at Indiana Regional Medical Center.